I had about 5 minutes to make my lunch today and came up with a quick and satisfying meal-in-a-bowl I think you'd enjoy! Reheat your pasta (I used brown rice macaroni left over from last night's meal). Meanwhile, mince the herbs (I used cilantro and parsley) and garlic clove. In a large bowl, place the hot pasta and drizzle with olive oil and season with salt. Stir in herbs, garlic, seeds/nuts and parmesan. Done! Serves 1. Multiply ingredients as needed to feed more people. Delicious! Thanks so much for your great blog - I stop by often. 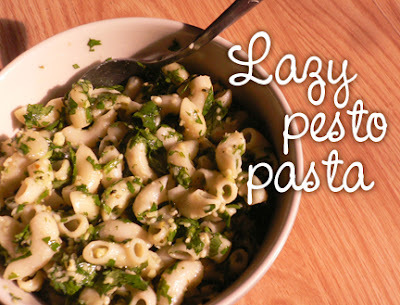 This recipe was perfect for this week because it's late summer here and the garden is full of basil and spinach.